The average price paid for a coop in Citylights has gone up by more than 75 percent over the past 12 years–to $645,000 in 2017–according to a new report. Patrick W. Smith, a broker with Stribling and a Long Island City resident, has released “The City Lights Market Report 2006-2017” and has analyzed all 314 sales that have taken place in the building over the past 12 years. He noted that the price appreciation of the average coop in Citylights was greater than that for the average Long Island City condo—up 70 percent–over that period. Smith said that he conducted the report after Citylights, which has 521 units, was profiled by the media last month with a focus on its rising maintenance charges. Furthermore, Smith said, the building is worth studying since it generates a great deal of sales activity. He said that there were more units sold at Citylights between 2013 and 2017 than at any other building in Long Island City—with 146 transactions, at an average of 29 sales per year. 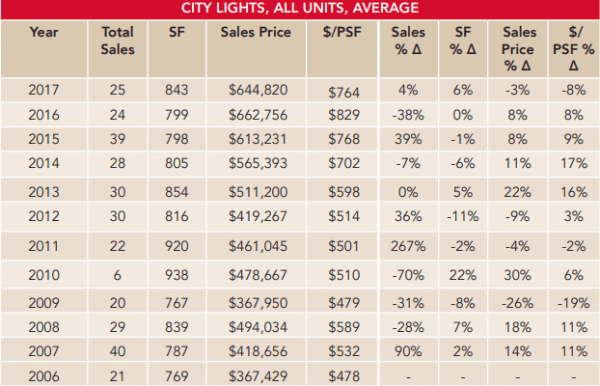 Smith’s research determined that the average sales price at Citylights increased from $367,500 in 2006 to $645,000 in 2017. Over that same period, the average sales price for a condo in the Long Island City grew from $647,000 to $1,103,000. Citylights has come under the spotlight lately given the rise in its monthly maintenance charges. The charges will be going up significantly over the next 4 to 5 years, since its 25-year tax abatement program is being phased out. The 5-year phase out period began this year at a time when the city hiked the building’s assessed value by 87%. Coop owners saw their maintenance go up 9 percent this year, to cover the cost of the first year of the phase out, according to public records. The costs associated with the taxes are being phased in at 20 percent increments over the next five years until the abatement vanishes by the end of 2022. The maintenance levels are expected to go up 9 percent each year–for the next four years– to cover the tax hike. However, many condo buildings in Long Island City will see their tax abatements phased out in years to come and there are several buildings that don’t have them at all, Smith said. But the building’s maintenance costs have always been high, largely due to the way the building was financed in 1997. At that time, an $86 million loan was put on the building to keep the initial prices down. The building still carries a large loan, with it paying $4.8 million last year toward debt servicing. The building also has to pay rent on a ground lease to The Queens West Development Corp that expires in 2095, and for its elaborate amenities. The monthly carrying charge for a one-bedroom, 677-square foot unit this year comes in at $1,564, according to Smith’s report. Meanwhile, the monthly cost of a two-bedroom, 1,029 square foot unit is $2,377; and a three bedroom, 1527-square foot unit is $3,527. The average monthly carrying cost at Citylights for 2018 is $1,947, according to Smith, compared to $894 for a condo. Smith said that buying a coop in Citylights still makes a lot of sense, given that it costs $1,103,000 to buy an average condo in Long Island City versus $645,000 at City Lights. In addition, Smith said, Citylights offers a superior location to most condos, with stunning views of the East River and proximity to Gantry Plaza State Park. The building also offers better amenities than most condos, he added. If it’s such an attractive buy, why are so many people selling it. There are 26 listings active right now. I feel this co-op is managed by fools to start with. There are 522 units in the building so 26 for sale is about 5% which is not a lot. Not affordable. I purchased my home in LIC in early 1998, did a full gut top to bottom rehab from the roof down to the studs, new pipes, boiler, everything with a legal conversion/addition of a two bedroom income producing apartment all for $250,000 with a 20 year abatement. Oh I forgot to mention parking as well. Amazing what some people will pay to live in this neighborhood and that’s only for maintenance. Citylights has been very stable and the maintenance was stable till a few years ago when the board started raising it 3% per year in anticipation of the PILOT tax ending. It is my opinion that the Maintenance should stabilize once again after the PILOT is fully phased in by 2022. In addition the board is fighting the assessment by the city and has a number of local politicians on its side. The Board has also implemented a number of cost saving measures which both reduce costs and put more money in the capital reserve. By 2022 the building should have a stable maintenance and huge capital reserve. There may be a few years of uncertainty but then values should start to rise significantly. If you want to own in LIC on the Water you only have Citylights or The View. That fact will never change and as long as LIC continues to improve in value so will Citylights. Citylights is a great long term play and it is currently in a buyers market so if you are planning to stay in LIC for the next 7-10+ years you should look at the Citylights building. Full Disclosure I lived in Citylights from 1996 to 2012 and am a broker in the building. Not sure why someone want to buy something that has a huge underlying mortgage. It’s like buying debt. Citylights is the pioneer high rise, designed well, with free amenities, and a cooperative. I live there. The tax hike by the city is a surprise, since we have a ground lease, with a lease and agreement from Queenswest Corporation–we don’t own the land–so what’s to tax? The added value we’ve built? Queenswest Corporation allowed Avalon to build overlarge cheapo designs flanking us, then all design sense went out the window as disasters of glass and steel shot up built by the Cornerstone corporation–a family owned business, like the Trumps, that gets around all previous strictures. Citylights is a co-op. 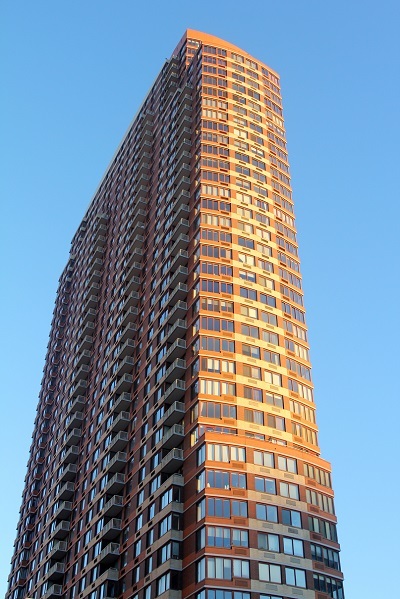 Only one other building on the LIC waterfront is tenant owned, a condo–still family related to Cornerstone. These buildings are making a fortune–perhaps the majority of their rental tenants are staying a few years, then moving away, while the majority of Citylights residents continue to be retirees or younger families. If the City wants to soak every last penny from their citizens, ask the very wealthy to pony up–and not have this area’s sole cooperative pay twice–rental to the Queenswest Corporation for land, and “owner tax,” as if the building was on City land. There is an investigative story to be unearthed about the Queenswest Corporation, and how and why its aim of fostering sound development perhaps became perverted into an excuse to favor the wealthy over citizen owners. I’m not surprised that a GREEDY real estate developer, like the one I voted for for president, is a huge liar. The city increased the tax by 87% over the previous year, that’s just unbelievable, but not surprising. The city needs money and they’re looking to get it anywhere they can. The residents will cry poverty but with a 20 year stretch of paying zero taxes and the killing they all made in terms of property appreciation I doubt the city shows any concern. This is an advertisement for City Lights. Nice try. I live here and can tell you that the management is fleecing the owners. If you are looking to buy, stay away until they sort out their financial troubles. Currently, there are much better options available in the area. It is a buyers market as of now. So look around and give this one a pass. The current board plans on upping the maintenance 10% every year for the next 8 years to cover the recent increase in taxes. Will it be a good deal then? Its over five years including this year’s increase. Please get your facts straight. If my maintenance is $2000/month, including this year’s 10% increase as you say, my maintenance will go up five times from $2000 to $2200 to $2440 to $2684 to $2952 to $3247. That’s more than a 60% increase. Does that seem reasonable or fair? What actual amenities or services are being added to make it even slightly worth it to live there? The Maint. is increasing 9% not 10%. I know it is a slight difference but every bit matters and it is going up 4 more times not 5. This is still a lot but still less than renting in LIC. In addition the equivalent sized CONDO (not on the water) would be $900,000 to $1mm while you can get a 815sf convertible 2br in Citylights for $560,000 – $650,000 with a $1,550 – $1,786 Maint. You can borrow $100,000 for about $500 per month. So the differential in $600K – $900K is $1,500 per month in Mortgage Payments making Citylights a better deal than the condos. Having just done my taxes, I found that owning a co-op (at Citylights) with an underlying building mortgage deduction and the tax share for my unit (and also those deductions for anyone with a bank mortgage), added up to a surprising refund–with other deduction, of course. Factor that into the economics–and owning still beats renting by long shot. Nice sales pitch but I ain’t buyin’…literally. These prices are, simply put, criminal. These aren’t even private homes, where you are your own boss, but are places where ‘they’ tell you what you can and cannot do with and in your own home. Who on earth are these buyers? Liz- You want a home buy a home. Co-ops are corporations that issue shares to share holders, those shares allow the registered owner to live in the apartment. co-ops are all about the rules and regulations. Many condos are adopting co-op type rules. There are no secrets here, you’ve exposed nothing. If you’re a house person buy a house. Many people like co-ops for the security factors of investigating new residents and rules regarding behavior. You sound too bossy for a co-op. Liz FYI there are always rules, you just can’t do “what you want with your home”, that’s a myth. Liz Evers, do you know what’s also criminal? 7 figure prices in the Ditmars and Upper Ditmars area for homes that that are not near the subway and haven’t been updated since the 1950’s and are 100+ years old.